Oil prices moved higher yesterday supported by a constructive API report, geopolitical tension and an OPEC announcement. The OPEC Technical Committee discussed the option to change the method of measurement for target inventory levels from the current 5-year moving average to the lower 7-year moving average, which would likely extend the production cuts. Yesterday, crude prices gained $1.30 (2.0%) during the trading session, closing the day at $63.40, a price not seen since February. 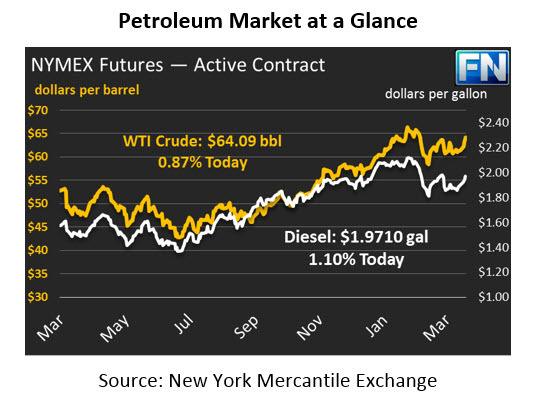 Crude has continued its rally into this morning, gaining another 55 cents (.87%) to trade at $64.09. Refined products made significant gains yesterday following crude’s lead. Diesel saw a large gain of 3.6 cents on Tuesday and has kept that momentum this morning. Today, diesel has gained 2.2 cents (1.1%) and is currently trading at $1.9710. Gasoline also rallied yesterday gaining 3.68 cents. This morning, prices continue their upward march gaining 1.49 (.76%) cents to trade at $1.9808. Yesterday’s API report was supportive for the oil complex. Crude posted a surprise draw of 2.7MMbbls, contradicting the market’s expectation of a 2.6MMbbls build. Gasoline and diesel were both mostly aligned with the market estimate, drawing by 1.1MMbbls and 1.9MMbbls respectively. In spite of a draw in inventories, API reported an additional 1.7 MMbbls build in Cushing stocks, building on the 0.3 increase reported last week. Although WTI prices are driven by Cushing stocks, prices managed to rally despite the inventory growth. The market is trading firmly ahead of this morning’s EIA data.